Although not in my step. I have a terrible cold for days now so I’m not able to smell anything and if something is strong enough to register, it hurts my nose and throat. But the weather is warm (incredibly so for this time of year) and the sun has been shining all week and should keep doing so in days to come even though it shouldn’t be this warm. So, it’s the perfect time to dive into spring scents and I’m dying to do so, but at the moment, it is only a heartfelt wish that will have to wait. In a vain attempt to smell spring, I sprayed Dawn’s Dutch Blue Hyacinth this morning only to smell the barest whiff of something first 5 minutes and nothing from then on. I couldn’t decipher what it was that I was smelling before even that disappeared (as only the first strongest whiff managed to pass through my runny nose). Oh, I am so very much looking forward to the moment I can enjoy spring through my nose! Ines, I had a similar experience with DBH – the first few seconds are glorious, and then nothing. Absolutely nothing. :(Here where I live, we just got 10 inches of snow dumped on us…no spring yet! BF, I seem to have phrased myself wrong. I couldn't smell anything because my nose is congested so only the beginning strong waft managed to get through, the rest can't pass through my nose. :)DBH doesn't have a tremendously long stay on me, but I do manage to smell it longer than this usually. So sorry to hear it disappears on you – especially as I love the smell of hyacinths and don't want their smell to vanish. Ines, would you kindly waft some of that Spring weather my way? We had a warm deluge last Sunday until evening, when everything turned to snow, such that on Monday we woke up to a foot of the white stuff. After that rain, rain and more rain, so now we have flooding. :)But that's March in Pennsyvlania for you. Enjoy your sunshine, and I hope you get over your cold quickly! Ines, it is warming up in the UK too, although we've had a nagging easterly wind for a few days. I understand your frustration with a nasty cold and a blocked nose. My family have had these nagging colds all winter and it does make life difficult for perfumistas! Hope you feel better soon. Suzanne, I would happily send some spring over. Today we are expecting 18 degrees Celsius (considering it's been -6 Celsius in the morning only a week ago) so we have more than enough spring here. I plan on sitting in the sun a bit later to feel it warm me through to bones. Ahhh, spring. :)Hope you get some warm, sunny weather soon! Michael, yes, I remember reading on your blog you were struggling with a cold this winter. I was already happy how a cold completely missed me this winter, only to get it now that the weather turned warm. 🙂 Oh well, at least I know it lasts a week and then I'll be enjoying myslelf again smelling spring in the air. 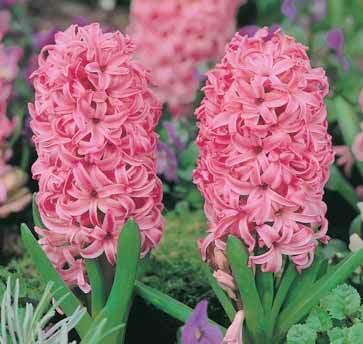 Tarleisio, I remember the smell of hyacinths (and lilies of the valley) since my early childhood as my mother loves them and there were always some hyacinths around spring in our home (and mimosas). LotVs we used to gather in the woods whenever we'd go outside the city. That's why I love Tauer's Carillon – it represents for me that experience. :)Thanks for the well wishes! Get well soon, Ines! I imagine I will have a cold in a few weeks myself. A change in season always seems to bring one my way! JoanElaine, I do hope this change in season is beneficial to you and cold passes you by.